We are glad that you gain on our homepage a first impression of this charming ‚home‘ – the Domizil Gols. Perhaps, our ‚Boutique Hotel‘ in the village centre of Gols at Lake Neusiedl or one of our nearby studio appartments ‚Studios Am Anger‘ may become soon your domicile for the good life‘ for some days. 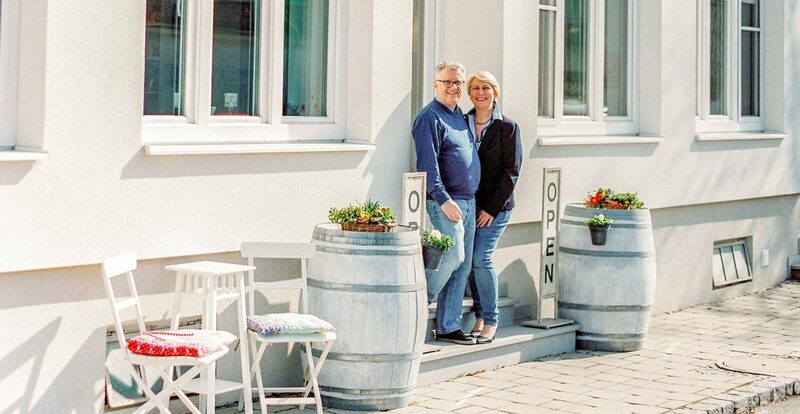 Our ‚Domizil‘ is located in one of the most inportant wine villages in Austria, at the edge of UNESCO World Heritage‚Fertö / Neusiedlersee Cultural Landscape‘ and National Park Neusiedler See-Seewinkel. ‚The good life‘ is our motto and the entire atmosphere of Domizil Gols reflectes this attitude owards life. In the spacious and tastefully furnished room, at breakfast based on the slow food idea or in the quiet typical ‚pannonian‘ backyard you can just focus on having a good time! For wine lovers, we arrange with pleasure a wine tasting in a winery in Gols or anywhere in our wine region. Several excellent restaurants, country inns and wine taverns in Gols or in nearby villages are available for any culinary needs of our guests. A very well developed network of cycle pathways is available for cyclists, on the shores of nearby lake Neusiedl there are also opportunities for for swimming, sailing and windsurfing. Gols can be reached with the public railway from Vienna main station ‚Wiener Hauptbanhof‘ as well. There are opportunities to rent bicycles and e-bikes locally or in the surrounding villages. For hikers there are available the local wine trail ‚WeinWegGols‘ and the regional Way of St. James. Navigate through our homepage and get a preview of our elegantly designed holiday home with our attractive offers and packages. We would be highly appreciated to welcoming you at our resort in the future.